Great product and fast shipping, excellent seller!! This is going to be a Hands on Reveiw because I have Not installed them yet do to Freezing cold tems and Snow/Rain So initially I looked at some reveiws and by the Details I figured worst case they're still better than my Factory speakers. Upon opening the Box and inspecting them. I am more than impressed with the overall feel and looks. The Pictures don't do them Justice. When I install them I will Edit this review or add to it. 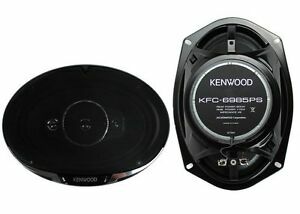 I can tell you this I have had similar Kenwood 6x9's and only 1 out of 4 pairs had a problem and it was that 1 of the tweeters had a capacitor explode. Great add on with the right amp. These speakers really pushed my system to greater lecels with the addition of a Planet Audio 1200 watt amp. The bass is really defined and the mids and highs are much more crisp sounding. I highly recommend these speakers. I bought these to go in wedge boxs in the back of my Explorer. Putting 125watts to each and they sound great. Very clear, good bass, and LOUD.